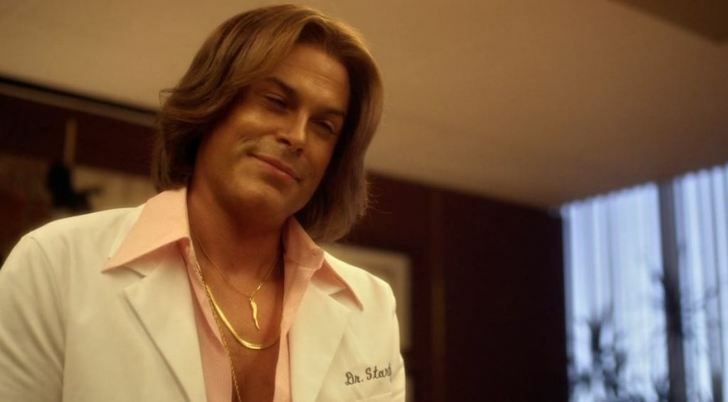 There are three big draws that compelled me to watch Steven Soderbergh’s “Behind the Candelabra”: 1.) Michael Douglas playing flamboyant pianist Liberace 2.) Matt Damon playing his young boyfriend, and 3.) it’s supposedly Soderbergh’s last movie. When it was first announced, Douglas seemed like an odd choice, yet it’s hard to think of anyone else embodying Mr. Showmanship after watching it. How surprising it was to learn that Damon has an even bigger, more challenging role than expected. Both actors bite into some saucy material here, as they reunite with a director who’s guided them through some of their best material (“Traffic” and “The Informant!”), but I find it hard to believe a filmmaker so gifted can just retire from the medium altogether, especially when this isn’t his best work. Like the 1988 book of the same name it’s based on, the movie takes us through the last ten years of Liberace’s life. The author of the book, Scott Thorson recounts his years with Liberace, as his young lover, best friend, chauffeur and surrogate son. So, the story adapted here introduces us to the famous performer from the eyes of a young man enamored by the glitz and glamour so prevalent on stage and the charm and nurturing adornment he was exposed to backstage. The movie starts out in 1977, where a young Scott Thorson (Matt Damon), working as an animal trainer for Hollywood movies, connects with Bob (a mustachioed Scott Bakula) at a San Francisco bar. Bob is a friend of Liberace (Michael Douglas) and the next thing Scott knows he’s swept to Vegas to see the showman perform. He’s immediately smitten and the two are probably the only men in the audience who see Liberace is gay. After the show, Bob takes Scott to Liberace’s dressing room (or elaborate suite), where the performer sizes him up and insists the blonde, feathered-haired Scott calls him “Lee” (a name only reserved for close friends), leaving the young man flattered and awestruck. Lee invites the two for brunch to his extravagant home the next day, where the two hit it off even more. Lee blushes with gratitude when Scott offers to get medication for his beloved blind poodle, Baby Boy. Days later, Lee receives a call from Scott, telling him the medication will be sent in the mail. Lee refuses to wait that long and insists that he fly Scott back to Vegas that night. The two spend more and more time together, much to the dismay of those in service of Liberace, and one night as the two sit in a hotel suite hot tub overlooking the Vegas lights, Lee confesses his loneliness to Scott. He tells the puppy dog Scott he’s never sure is people want to be around him for who he is or for what he can give them, “No matter how many people are around me, I’m all by myself”. Having grown up in a foster home, Scott feels drawn to Lee’s confession and the two soon realize they have much more in common than just their home state of Wisconsin. Lee insists that Scott come work for him, as his “right-hand man” or his bodyguard or his secretary or just to be his confidant – you get the idea. Next thing we know, Scott wakes up in bed with a creepy old man in a bad bouffant leering at his naked body. That’s just the beginning of many of the “Ew!” moments that Soderbergh plays up. It doesn’t take long for the bisexual Scott to become the live-in boy toy., much to the confusion of the foster parents (played by Garrett M. Brown and Jane Morris) who raised him. He’s afforded whatever luxury he wants, from fancy wardrobes to sleek sports cars, all while being looked down upon by Lee’s longtime manager Seymour Heller (Dan Aykroyd) and house servant Carlucci (Bruce Ramsey). Soon Liberace is talking adoption papers with the naive Scott, promising to take care of his lover/employee like a father. While Scott is flattered and awkwardly honored, he becomes distressed when Lee insists that Scott gets plastic surgery to alter him into a younger version of himself. That’s when any secure individual with common sense would’ve hit the road. Inevitably, Scott sees the star for what he is – a miserable, insecure and paranoid man who refused to let the world know who he really was and one who had an expiration date for each young man he’d take in. It starts when Lee suggests they free themselves up to see other people and then reality hits hard when Scott is treated coldly by the surrogate father and watches as he flirts with the newest young man to surround the star. After being turned into Liberace’s own Frankenstein monster, the drug-addicted Scott has nowhere to go, accept to a lawyer (Paul Reiser) and file a palimony suit. That doesn’t end well. Soderbergh ends the movie in 1986, when Liberace died of AIDS (something that had to be confirmed by autopsy) in Palm Springs, California. Scott is called to Lee’s deathbed for reconciliation, where the decaying entertainer declares that Scott was always special to him. By then, the once vivacious character is reduced to a pathetic character, almost asking for sympathy from the audience. But that ship has sailed by the end of the feature, where we’re left with a sleezy predator and the man-child who was used by him. 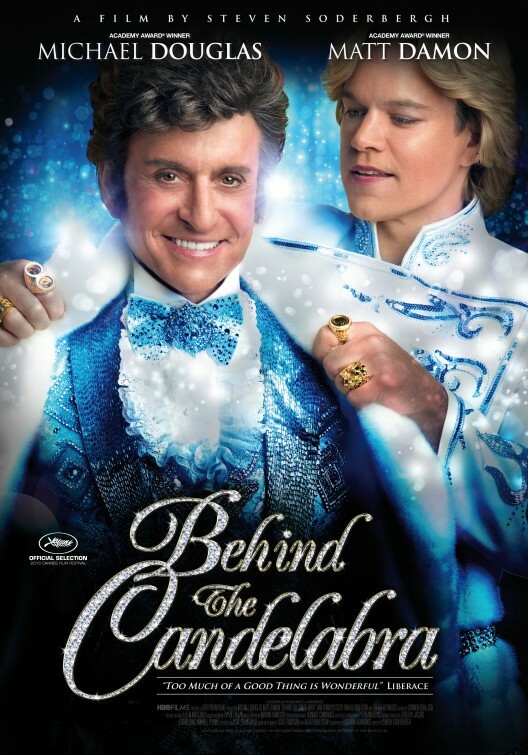 “Behind the Candelabra” couldn’t get released theatrically in the States, even though it had a run in the UK. From what I’ve read, the top dogs at Hollywood deemed it “too gay”. It did however premiere at Cannes this year. Considering the subject and how he had become a pop culture joke in his later years, one would think the screenplay by Richard LaGravenese (“The Fisher King”) would ham it up a bit more, but instead we’re given hints of mischief and an undercurrent of creepiness throughout. Purposeful or not, that’s the vibe I picked up. The script here isn’t concerned with an indepth look at who either of these two self-destructive men are, instead offering more of an overview of the ups-and-downs of their tumultuous relationship, hidden from the public. While it doesn’t really feel like this feature offers much to the biopic genre, it does serve as a reminder at how detailed of a director Soderbergh is. The retro late 70s HBO logo that appropriately starts off the feature and is only a fraction of how thorough the movie will be. The attention to all the gaudy and lavish interior decoration found in Liberace’s property is uncanny and quite garish. It’s hard not to notice Lee and Scott lounging at home watching adult fare or Liberace’s 1979 appearance on The Tonight Show on an old Magnavox VHS console or a Sony TV with a built-in Betamax. That stuff made me chuckle. Soderbergh peppers the film with a fare amount of CGI here and there, but nothing too distracting. It’s obvious early on when the camera is fixated on Liberace’s hands tinkling the ivories (yeah, that’s not Douglas) and also later on, when he gets an extreme nip and tuck from the ghoulishly tight-faced Dr. Startz (a naturally made-up Rob Lowe – a standout). 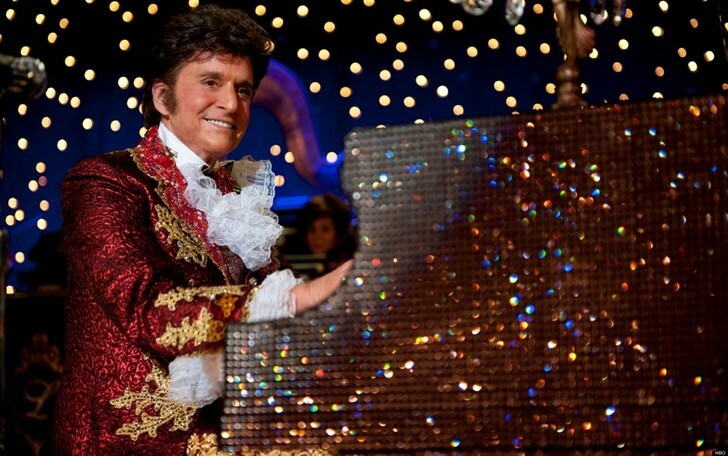 Soderbergh’s cinematography relies on heavy use of glittery golds and bright gloss, while his costume designer works overtime with all the jeweled muumuus and feathered gowns Douglas wears as Liberace. As far as the music goes, there’s plenty of “Liberace music” during his concerts, as to be expected, everything else is supplied by the late Oscar-winning composer Marvin Hamlish. There are nice touches to the soundtrack that don’t involve music whatsoever, like when we all we hear are poodles yipping in the background while Scott and Lee get to know each other. 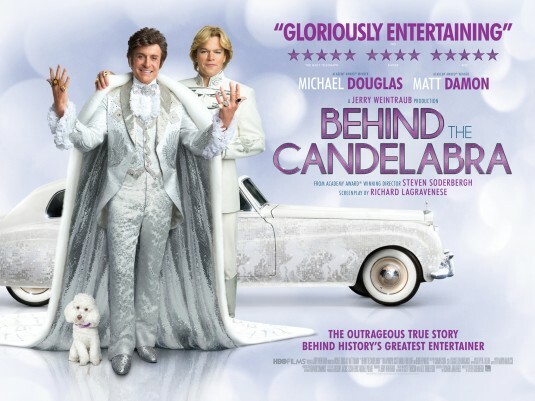 Other actors show up in “Behind the Candelabra” for some choice cameo roles, such as David Koechner as an adoption lawyer, Cheyenne Jackson as one of Liberace’s protege and Debbie Reynolds as his controlling mother. But the movie belongs to Douglas and Damon, who, although deliver fantastic work here, come close to disappearing in their roles. It’s hard not to appreciate their commitment, but it’s also hard not to be distracted by the wig Damon wears early on and how Douglas really should’ve channeled Paul Lynde a little more, instead his own recognizable voice coming through. The second act may be somewhat aimless, but seeing Douglas and Damon is nevertheless a sight to see. 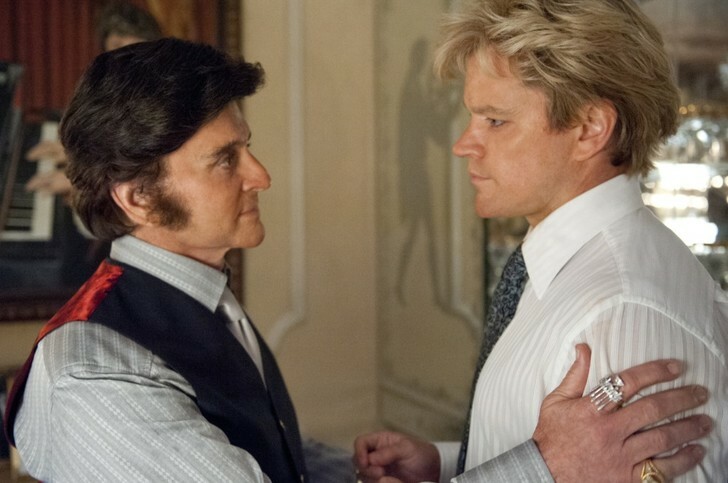 “Behind the Candelabra” may be a curiosity piece for some and that may be reason enough to catch this supposed swan song for Soderbergh. It was for me and I don’t regret it. So many films have been ruined for me by wigs. Nevertheless I am dying to see this. Looking at all the dross that does the rounds I can hardly believe this film didn’t have a theatrical run in the US. No wonder someone as gifted as Soderbergh feels like retiring, I feel the same.